The climate targets announced this month by the United States and China will require a significant effort beyond a business-as-usual scenario for both countries. More details will likely follow in the weeks and months ahead, but here is what we know so far for each country. China announced a goal for its greenhouse gas emissions to peak by 2030 or sooner. This marks the first time that China has pledged a peak or absolute target for greenhouse gas emissions, rather than an intensity-based target. In business-as-usual scenarios, China’s emissions wouldn’t peak until 2040 or later. China also announced it would boost its share of zero-carbon energy, which includes nuclear, hydropower and renewables, to 20 percent – up from about 13 percent today. Meeting that goal will require a substantial build-out of nuclear power stations, hydroelectric stations, wind turbines, and solar panels, as well as transmission and other infrastructure. In a separate announcement, China said it plans to cap its coal consumption by the year 2020. China can’t, as critics claim, sit idly by for 15 years and reach these targets. It will need to significantly restructure its energy system. China will have to add more than 1 GW of zero-carbon power a week for the next 15 years – an amount roughly equal to the entire installed electricity capacity of the United States. The United States announced a goal of reducing its emissions 26-28 percent below 2005 levels by 2025. This will require the successful implementation of several announced proposals as well as significant additional measures that have not yet been formally offered. Requirements for the U.S. to meet its post-2020 emissions goal. Source: C2ES analysis. In 2012, U.S. emissions were already 10 percent below 2005 levels. But under a business-as-usual scenario, energy-related greenhouse gas emissions are projected to rise, leaving U.S. emissions just 2.5 percent below 2005 levels in 2025. 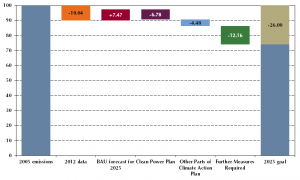 EPA’s proposed Clean Power Plan, if implemented in its current form, will likely reduce emissions in 2025 by at least 491 Mt, or about 7 percent of the 26-28 percent reduction targeted. This is based on achieving a 30 percent reduction of power sector emissions from 2005 levels by 2025. Additionally, programs to reduce HFCs, methane, and other actions announced in June 2013 as part of President Obama’s Climate Action Plan could achieve a further 4.5 percent reduction. This would leave a gap of around 880 Mt, or 12 percent of the target. Some of this gap could be made up by more stringent vehicle standards for heavy-duty trucks, increased regulations to reduce HFCs and methane, as well as stronger efficiency standards for equipment, appliances, buildings and industrial sources. U.S. emissions could fall further if the Clean Power Plan or other mechanisms drive stronger substitution of natural gas for coal, more use of renewable energy and nuclear, and/or higher levels of energy efficiency. Greater use of biofuels and policies that promote the adoption of alternative fuel vehicles could also lower emissions. The announced targets are China’s and the United States’ intended contributions to an international climate agreement to be negotiated in late 2015 in Paris. The fact that the two largest emitters have proposed targets that require significant ambition beyond business-as-usual, well ahead of the Paris meeting, makes us optimistic that other large emitters will be encouraged to make meaningful contributions as well.